Let me begin this review by saying I am not a blush person. My cheeks are naturally really red, so I stray away from using blush in my everyday routine. However, on those days where I do where blush, I’m extremely picky on choosing my blush. 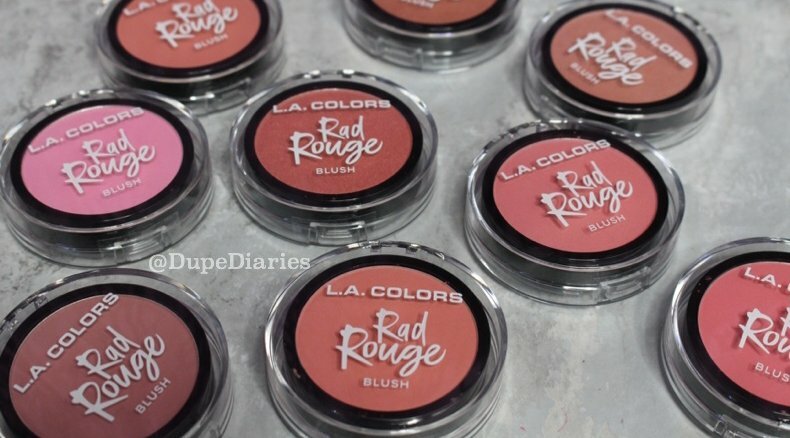 With that being said, most of the new Rad Rouge Blushes from LA Colors I probably would not wear on a day to day. I received nine of the 16 blush shades from LA Colors, which is really over whelming. That’s a whole lot of blush, not enough cheeks on my face. The first thing I noticed was that the blushes were not all out, they’re more on the natural side (Which I really appreciate… there’s nothing worse than having to see someone with a pink stripe on the side of their face). I didn’t swatch all of them because I do not think all of them will go with my skin tone (plus as I mentioned above, I do not normally wear blush on a day to day). The ones I swatched are the ones I thought would compliment my skin tone best and were the prettiest in my opinion. My personal favorite is Preppy. It’s a shimmer finish blush… it’s a bit more of a light pink so it sort of doubles as a blush and highlight (swatched with brush that comes in the compact). Finger swatches are obviously unrealistic because fingers will always grab more product than a brush. However, with a brush the product picks up very nicely, it very pigmented… so go in very light handedly. Each compact comes with blush (of course), a mirror, and a brush. 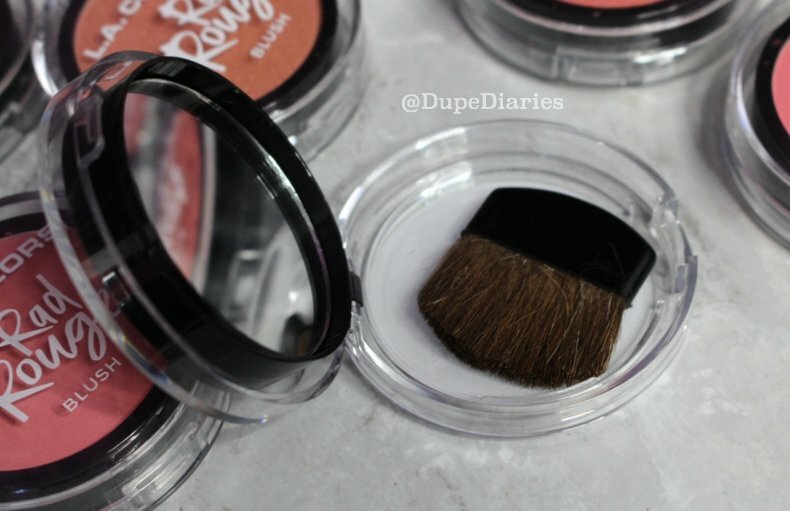 The brush is nice to keep as a backup or for retouches; but it does pick up a bit too much of the product (at least for my taste) so you’re better off using your favorite blush brush. As for amount of actual product, I think it comes with a good amount of blush especially for the price point. It’s really affordable and the collection of blushes has a lot of great alternatives to higher priced brands, many of which aren’t cruelty free like LA Colors is. Overall, I think the product is great, pigmented, and does come with the brush and mirror; which are always good bonuses to have. So would I recommend this product? If you enjoy using blush on a daily basis (or whenever you do your makeup), then I would totally recommend to try which ever one best catches your attention.